PC Gaming Tips: An Alien Message? Ramblings on technology and techniques for PC games and gamers, with occasional forays into other things gaming, tech and net related. Wolfram|Alpha: Systematic knowledge, immediately computable. This just may be the ultimate 'tweetable program' that does something interesting. I first saw this kind of conciseness in a pamphlet sized book back in the seventies that highlighted the efficiency of the language used, APL (A Programming Language). The author had taken the winning code from a programming contest, where conciseness and correctness were highly scored, and adapted it to APL. One line to do the classic brain teaser puzzle Instant Insanity. The particular piece of code heading this entry produces the generations of the board for Conway's Game of Life. The complexity of the patterns that result, and the 'behaviors' that appear can be mind boggling. One pattern might result in every cell quickly dying. Another could result in fantastic evolutions of patterns and shapes. Some patterns produce 'gliders' that crawl their way across the matrix. Some even birth copies of themselves (none have been seen yet, but the proof of such patterns in the game is available in Winning Ways for your Mathematical Plays by Berlekamp, Conway and Guy). The list of possible patterns is endless, as are the results they generate, and aficionados of the game actually host contests where players supply initial patterns that 'fight' each other until a winner is decided. You can view other more complex patterns, including some that do useful work, at the video link at the end of this article. The game is perhaps the first widely known example of a cellular automaton, and exhibits Turing completeness, that is, the game is sufficient to simulate the Universal Turing machine. This means a sufficiently complex initial game board, given a sufficient time span, can perform the same 'program' as a computer with infinite memory and no time constraints. If that doesn't startle you, it's time to fill up your coffee mug! All of this complexity captured in one line of APL code. Take a moment to absorb these two morsels you've been handed. In one line of APL, we have the Game of Life. In the Game of Life, we have a Universal Turing Machine. That one line of APL could conceptually (given no constraints on memory or time) run any program you could possibly write, or even imagine. Any program that could ever be written. What an amazingly concise language! I quickly fell in love with APL, particularly because of my mathematical bent, which the language is ideally suited for. I suffered many a time from the denseness of the language though. A running joke of the time was that the language was 'write once, read never', capturing the difficulties that the author of particularly terse APL might have deciphering their own code when returning to it after some time. The language uses a family of special characters to represent various monadic (taking the result of everything to the right of the symbol as the argument) and dyadic (accepting an additional argument, the first data to the left of the symbol) functions. It is in fact based on a mathematical notation developed by Kenneth Iverson for array manipulation that he used with his students at Harvard University. In some cases, functions are represented by overstrikes, that is, literally typing a symbol and then typing another symbol over the original. The use of this depended on the system involved, and in general the same functionality could be accomplished without needing overstrikes. There are also versions of APL that provide special character input using combinations of standard characters via input method editors to represent the symbols. The concise use of functions applied using the language's simple recursive precedence rules (the right argument of a function is the result of the entire expression set to the function's right) and the incredibly high level of abstraction possible makes for ridiculously rapid, interactive and iterative solutions to even the most fiendishly complex problems. Functional programming before functional programming was cool. Oh Man! This was a computer lover's dream machine. 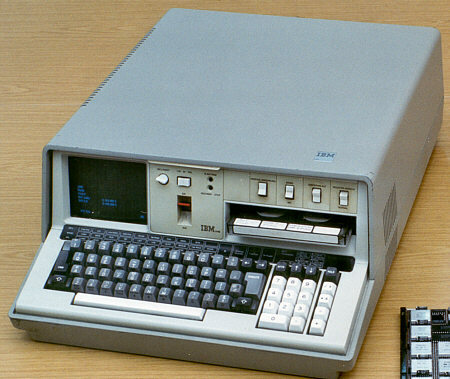 Arguably the first 'portable' computer (at over 53 pounds wet), the IBM 5100 represented a giant leap in movable computing power. Fully equipped with a whopping 64KB of memory and tape drive, with BASIC and APL programming languages (selected by flipping a toggle switch on the front panel), and a giant 5" CRT display of 16 lines of 64 characters each, it cost about $20,000.00 in the mid seventies. That's roughly $80,000.00 in today's dollars. A sophisticated digital wristwatch likely has more processing power today, and certainly most smart phones would leave the 5100 in their dust. I still lust after one! Enough already with the trip down memory lane! Back to the subject at hand: APL. Functional programming in the seventies. Preceded only by Lisp. You can watch an expert APL user building the game of life from scratch in the video below. Fascinating and frankly still jaw dropping to me after all this time. In addition, an interesting five minute video that shows many different initial starting patterns and their results including one where prime numbers are part of the resulting behavior can be seen at Amazing Game of Life Demo on YouTube. If you want to experiment with the game and try your own patterns, the open source, cross platform implementation of the game in Golly is superb. Golly also provides a large library of already built patterns ranging from simple to complex, amusing to beautiful, and useless to startlingly capable. Totally lost me on this one. I've heard of conways game of life, but really don't get what it is. The wikipedia entry at Conway's Game of Life is a good overview of the 'game'. It is responsible largely for the explosive growth in interest in Cellular Automata, and the study of simple rules and starting configurations that can result in extremely complex appearance and 'behavior'. Whole books have been written about this, such as Wolfram's 'A new Kind of Science'. There are even cases where nature uses cellular automata. An example are some of the cone shells: these can have incredibly intricate patterns on their shells. It turns out that the pattern is made by a narrow strip of cells on the lip of the shell that follow a simple mathematical 'rule' for producing pigment. Wolfram talks about things like this, and much more, in his book. Whither the Sound Card? : Why add-in dedicated sound cards for gamers are going the way of the dinosaur. Game Theory for Gamers: A brief introduction to Game Theory for the novice . GPGPU: General Purpose Computation on Graphics Hardware, the Next Big Thing for PC Games? A Bathroom Reader for Computer Science. A µ post. So You Wanna Be A Programmer? Splinter Cell Conviction µ-review. A µ post. I P in the Pool. Boo! I have you now, child of Satan! CodZ - GKNOVA6 related info. Dropbox: Free secure, synchronized online storage across all of your PCs. Micrsoft Skydrive: 25GB Free online storage. Animated evolution of Analemma and Equation of Time over the year.